I am paying for my excitement today. I stayed up until 2 am this morning to get this MODA Love round completed, but I’m so thrilled about it. The pictures below were taken around that time, so they aren’t are clear and crisp as they should be. 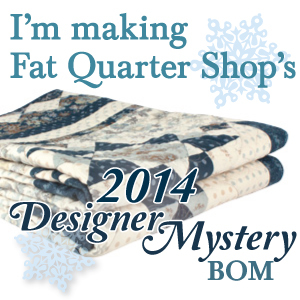 I took off the earlier borders of my Round 1 block, and added back a single border of the same black print fabric. L.O.V.I.N.G. it! I have already sorted out my layer cake of American Jane Potluck and need to cut out the black background pieces for Round 3. Perhaps by this time next week, I’ll have it done and will be working on the pieced charm square border. Another colorful quilt in my future! Thinking a bright white background for Whit. Round 2 looks fab!! You’re going so well with this. Love the packs for the new quilt.